"Mom," said the Precise Kitchen Elf, "I signed up to bring lemon squares for my English class potluck on Thursday." Okay, remind me to get everything out for you on Wednesday. So, last night, he took a break from studying for finals to make a triple batch of lemon squares. One batch went to his potluck; a second batch went to work with Jake; and the final batch stayed home. I haven't tried them, but I got an email from Jake's boss that read: "Your lemon bars..... Nailed it! The ratio of lemon to crust is perfection. Truly made my morning. Thank you!!!!!" In a food processor, pulse the flour with the sugar and lemon zest. Add the butter cubes and pulse until chunks the size of small peas form. Pour in cold water and limoncello, alternating 1 T at a time. Pulse between each addition till the dough comes together in a ball. Press the dough into two baking dishes, sprinkling the top with ground almonds to prevent it from sticking to your hands. Bake for 20 minutes until golden brown. In the meantime, make the topping. To make the lemon layer, whisk together the eggs, sugar, flour, baking powder, lemon zest, and lemon juice in a bowl till smooth and combined. Pour lemon mixture over the cooked base. Bake for another 25 minutes. Leave to cool. Before serving, sprinkle with powdered sugar. Slice into squares. I did send off an email to the English teacher - in case R forgets to mention - that there are nuts in the crust. Hopefully there are no nut allergies, but if so, at least they have been warned. It's hard to believe that I have never posted a recipe for my favorite pie. But when I came home from the 8th grade camping trip with leftover Meyer lemons that we had grabbed from my mom and dad's tree, I decided it was time to remedy that. Now, I love a lemon meringue pie in all its variations, but my favorite is when it's made with Meyer lemons. In case you're not familiar with these beautiful citrus, here's a little bit about them. Meyer lemons were first introduced to the United States - from China - in the early 1900s by namesake Frank Meyer. A cross between a lemon and a mandarin (orange), the fruit has smooth, golden skin that can be as deeply hued as a farmhouse egg yolk. The rind is thin and the amount of juice contained inside is astounding. Additionally, the juice lacks the acidic bite of a regular lemon though it's big on sweet and tart. It's an amazing flavor. In a food processor, pulse the flour with the sugar and salt. Add the butter cubes and pulse until chunks the size of small peas form. Pour in lemon extract, water, and gin. Pulse, again, till the dough comes together in a ball. Turn out the dough onto a piece of parchment paper and knead 2 to 3 times. Form into a disk, wrap in plastic and refrigerate until firm, approximately 1 hour. Roll crust out between two pieces of parchment paper. Transfer to your pie pan. Trim and shape the edges. Place a piece of parchment paper in the bottom of your crust and add pie weights, dried beans, or a handful of uncooked rice; I used rice because I couldn't find my pie weights. Preheat oven to 375 degrees F. Pre-bake the pie crust for 20 to 22 minutes. The crust should be firm and slightly golden brown. Remove from the oven and set aside. Whisk egg yolks in medium mixing bowl and set aside. In a medium saucepan, whisk together water and sugar. Turn heat on medium and, stirring frequently, bring mixture to a boil. Boil for one minute. Add 1 ladle-full of the syrup to the egg yolks to temper them, then pour the remaining eggs into the syrup. Cook for another minute. Remove from heat and gently stir in lemon juice, lemon zest, and butter until well combined. Whisk in the flour so there are no clumps, then return to the stove, over low heat, and cook until the mixture thickens to a curd consistency. Pour the filling into the baked pie shell and set aside. Work quickly to make the meringue. Place egg whites in a clean medium mixing bowl. Beat egg whites until soft peaks form. Gradually add sugar and continue beating until stiff peaks form, approximately 2 to 3 minutes. Spoon the meringue over the filling, making sure that the meringue reaches all the way to the edge of the crust. Use a spoon to make some peaks in the meringue as the tops will brown nicely while the low spots will stay white. Place the pie back in the oven. Bake until meringue is golden, approximately 8 to 10 minutes. Remove from oven and cool on a wire rack. Make sure pie is completely cool before slicing. Today is our final May post for our Kitchen Matrix Project, named after Mark Bittman's Kitchen Matrix cookbook. You can read about the year-long project: here. This month, I chose the recipes and went with a Latin theme. So, we have worked with masa; we made salsa; we braised carnitas. And so on...you get the idea. Next month, Karen of Karen's Kitchen Stories selected our recipes. Stay tuned! This week I chose Ice Pops + 12 ways, but couldn't decide what to make. I love the idea of ice pops because you can customize them and it's not as time consuming as making homemade ice cream. If you don't have a copy of the cookbook, you can read his versions online. I wanted to make a few different versions, but time got away from me and I opted to make ice pops with Mexican Agua de Jamaica. It seemed to fit the theme...and I did make half of them boozy by adding a splash of tequila to the mix. In case you're curious, Bittman has fruity ice pop suggestions - think strawberry basil; savory - I was intrigued by the coconut curry one; creamy - can you say 'homemade 50-50 bars!?? '; and finally boozy - I will make the fennel Pernod one soon. Really soon. In a medium mixing bowl, stir together 1 C agua de jamaica and tequila. Pour into molds and clearly mark those since they are not kid-friendly. I used the Darth Vadar molds for the grown-up ice pops and R2-D2 for the non-tequila'd ones. Pour the remaining agua de jamaica into the rest of the molds. Place in the freezer. Freeze until completely solid, approximately 4 or 5 hours. Unmold and serve! Enjoy. Anyone who knows me knows that I have a black thumb. You know, as in can't keep any plant alive, or the polar opposite of a green thumb. Thankfully, D and Jake can grow things and both were really interested in sprucing up our back patio. So, as our afternoon project, the Enthusiastic Kitchen Elf and I set out to plant a container garden. We have sunlight and we have sand. So, everything needed to live in pots with good soil. We also have two kinds of zucchini, eggplant, lemon cucumbers, basil, thyme, and two kinds of mint. He watered everything while explaining the process to me, Ms. Black Thumb. Then he put up netting to keep the birds out of his plants. Hopefully the garden will flourish and we'll be picking all summer long. If nothing else, it was a beautiful way to spend the day with my Wombat! When fellow #Winophile Jill of L'Occasion reminded The French Winophiles that May 25th was Languedoc Day and because sponsors have been so generous with previous Languedoc events*, I wanted to give them a shout-out and pull together a round-up of previous Languedoc pairings to share. But I was offline - chaperoning an 8th grade camping trip on the 25th - so this is tardy. Je suis vraiment désolé. Once a source only for inexpensive, bulk wine, Languedoc is showing its ability to make fantastic terroir wines at affordable prices. As France's largest wine region, the Languedoc is home to an array of climates and wine styles. Typically considered red wine country, there are small amounts of rosés - particularly from Cinsaut, Syrah and Grenache - and an increasing number of whites made including Grenache Blanc, Marsanne, and local varieties such as Picpoul and Clairette. It has certainly won my heart with its breadth and depth of choices. 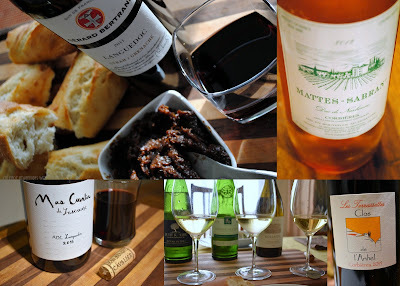 *Disclosure: In previously posted recipes, as noted, I received sample wines for recipe development, pairing, and generating social media traction. My opinions do not necessarily reflect the opinions of the organizer and sponsors of this event. Horchata was the other drink that Team Mexico prepared for their camping dinner. Awhile back, I was teaching a class about Rice Around the World and my co-teacher is from Spain. When she saw that I was making horchata for class, she was perplexed because in Spain horchata is not made with rice; it's made with a kind of nut. So, she didn't know how that was applicable to our class. Since her husband is one of the 8th grade teachers, so I asked him about their horchata while the kids played games before heading up the hill to set up camp. He explained about horchata de chufa. We found the translation as 'tiger nut.' But what I had prepared to make is the Mexican version...with rice! I did the first part of the process at home, but one of the students finished it up and got it ready for serving. Also, I did quadruple the recipe below to serve the masses. Add rice and 1 C boiling water to a blender (preferably high-speed blender or food processor) and let stand for at least 10 minutes for the rice to soften. Blend for several minutes until the rice is broken up a bit. Pour into a lidded jar and add remaining water. Add in the cinnamon sticks and let sit for 2-4 hours. Add milk, ground cinnamon, vanilla and simple syrup and give it a quick stir to mix it up. Let sit for another 2 to 4 hours – longer is fine, too! I left mine overnight. To serve, we did a final whirl in the food processor, removing the cinnamon sticks in the process. You can strain the horchata through a cheesecloth-lined fine mesh sieve and press out the pulp in the cheesecloth. But, in this case, the student who was making it said he wanted it thick. Adjust seasoning to taste, if you want more cinnamon or vanilla. Discard the rice pulp, if you've strained it, and serve the horchata with ice. I didn't circle back to talk to the teacher from Spain. I was curious how this version compared. for the virtual supper party feature for The Lost Family. All opinions are my own. A bunch of food bloggers are gathering - virtually, anyway - to share thoughts and inspired recipes ahead of Jenna Blum's June 3rd release of her new novel, The Lost Family. I was tickled to have been invited and love seeing familiar blogging friends - Wendy, Amy, and Sarah just to name a few - joining in. Also very happy to meet some new bloggers as well, including Beth, Emily, and Pam. And, I was so, so thrilled to be introduced to a new-to-me author that I already have a few more of her books on order. I can't wait to read more of her work! Click here for more information about the virtual supper club. One of the things I love about these virtual parties is, obviously, getting to read the book early and share my thoughts and - even better - connecting with the author herself. Jenna shared that all the menus in The Lost Family "are a fusion of 1965-era favorites and German-Jewish comfort food, Peter and Masha’s favorite childhood dishes: Masha’s “Little Clouds” (cream puffs with chocolate fondue), Brisket Wellington, Chicken Kiev, and my favorite, Masha Torte—an inside-out German chocolate cake with cherries flambé." Jenna admits, "I LOVE FOOD, and I had a joyous time creating and kitchen-testing all the recipes for Masha’s menus in The Lost Family (there are two, Spring 1966 and Fall 1965). I relied on my German friend Christiane’s mother’s recipes, my childhood memories of my Jewish grandmother’s dishes, the Mad Men Cookbook and similar cookbooks from the 1960s, and ingredients from my garden. ...but I’m not a chef, so there were some notable cataclysms, for instance throwing ice cubes into the oven to create crispy baguettes for Peter’s crostini (explosions) and dropping an entire Masha Torte on the floor (flaming explosion; we ate it anyway, and it was good!)." That would have been quite a sight to see! I'm not sure I would have been brave enough to eat the torte off the floor...though I'm certain she's a much better housekeeper than I am! And, then, she sent us chocolates and a recipe because it's not a party without party favors, right? That's what my kids say anyway! Thanks for these. Jenna describes her book this way: "The Lost Family is a novel about a German-Jewish Auschwitz survivor named Peter Rashkin, who emigrates to New York, starts a restaurant, and falls in love—only to find his new American family haunted by the wife and daughters he lost during the war." And I read through over 300 pages (riveted, by the way, but I'll get to that in a second) before it struck me. The title isn't just about the family that Peter lost when Masha, Vivian, and Ginger were ripped from his life during the war; the title also refers to the family that he has now. They are all lost. Peter, June, and Elsbeth are each lost and isolated in their own way. Rudderless, I might say. Maybe Jenna didn't intend it that way, but I suspect she did. Peter is driven. June is bored. And Elsbeth is a teenager. All of them crave something. I am not going to give away too much of the book. You should really just read it once it's released... just a few more days! But there are some passages that I wanted to share. These showcase her delicious prose. "[Peter] turned to the flats of seedlings he had hand-selected from various Long Island farms. These vegetables were the staples of Masha's spring menu, and he thanked them silently as he tapped them from their black plastic containers, untangled their roots, and set each plant in the soil. The salad greens - Bib and Boston lettuce and arugula - should be ready by mid-May, along with radishes, and about a week later, spring peas, onions, and leeks. The others would ripen in summer; Big Boy and yellow cherry tomatoes; beets, fingerlings, sweet potatoes, cabbage, Brussels sprouts, squash, cucumbers, string beans. Peter checked each type of plant off the list on his notepad once it was in the ground" (pp. 101-2). "Peter watched her, the smile fading now. Rain trickled down the window next to the bed, making shadows on his face. He was no longer the ghastly no-color he had been in the hospital, as translucent as if he were his own ghost, but his skin was still tinged the bluish white of the skimmed milk he disdained, claiming it tasted like water. ...She met her husband's inquiring gaze and held it, and she felt as if she were traveling an emotional umbilicus into him, arcing into what it must be like to be Peter, lying in this bed, helpless in this room; to be Peter in his kitchen, measuring, tasting, content; to be young Peter arriving in this country, an unwilling immigrant, pushed this way and that by shoving muscular crowds who had been born here, finding his way and place among them nonetheless" (pg. 289). I found Peter the most compelling character, but it's the intersection and collision of the three Rashkins that's the centerpiece of the book. They collide, they repel, and they clearly attract, too. As Peter is a chef, there is no dearth of food in this novel. We see menus from his restaurant. There are meals over which the characters linger; there are meals grabbed in haste. We read about lavish, exotic dishes; we get a snapshot of June's midwestern fare - think olive loaf and A&W root beer! And when I first read 'Little Clouds' on his menu from Masha's, I thought: meringues! Turns out that it was cream puffs filled with vanilla ice cream accompanied by mini chocolate fondue for dipping. But I still had meringues in my mind. Plus I had an abundance of egg whites from the base of my Fläderblomsglass (Swedish Elderflower Ice Cream). That recipe is posting soon, so stay tuned for that. Given my incorrect assumption about the Little Clouds on Masha's menu, I still decided to go with meringues for the party. I did dress them up a little with a few drops of natural food dye and some lavender-vanilla salt that I had on-hand. Preheat oven to 225 degrees F and line two large cookie sheets with parchment paper or silicone mats. Set aside. In a large mixing bowl - that's completely clean and grease-free - combine egg whites and tapioca starch. Using a hand-mixer, beat on low until mixture becomes foamy. Increase speed to high and add sugar slowly, about 1/4 C at a time, beating between each addition until the sugar is dissolved, approximately 10 to 15 seconds between each addition. Beat until mixture is thick, shiny, and has doubled in volume. Mixture should have stiff peaks. Once you get stiff peaks, stop. Stir in food coloring, if using. Fit a piping bag or tool the a large star tip. Transfer the meringue to the piping tool and pipe onto prepared sheets. The meringue cookies can be pretty close as they don’t spread. Sprinkle with lavender salt. Bake for 1 hour. Then turn off the oven and leave the door ajar. Let cool in the oven for another hour. Meringue cookies should be crisp on the outside. Store them in an airtight container and keep them away from heat. Heat and moisture will often your meringues. Enjoy with a strong cup of coffee...and a good book such as The Lost Family by Jenna Blum. *Disclosure: I did receive a complimentary, advance reading copy of The Lost Family by Jenna Blum for my participation in the #TheLostFamilySupperClub party. Opinions are my own. I received no further compensation for this post.